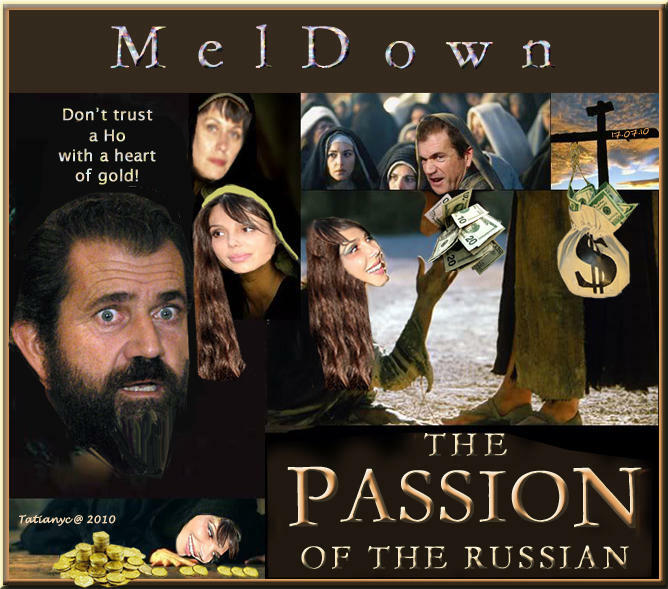 Take this from a Russian woman: drunks can do the silliest things, indeed, but I still believe Mel Gibson is a decent man. Too bad he lost his smarts letting himself being lured into the net of a seductive "black widow." Oh, I can tell you, I’ve met this type of amebas who live and breathe with one goal only, to capture a sugar daddy; get fixed, bear him a child, which entitles them to clean out the victim's banking account faster, then destroy the man. I feel sorry for Mel. He has my unconditional support! Welcome to the Collective Tatiana, love your avatar and let me say that Tatiana is one of my top ten favorite female names. Yes, those Russian mailorder brides often turn out to be gold diggers. The cuter they are and the wealthier you are the more suspicious you should be of their intentions. On the other hand, she was just being true to her Prog upbringing. Now a sizable potion of Mel's ill gotten gains will be redistributed in divorce court. Serves him right. Some one needs to keep the vodka away from Mel, he gets so angry when he's drunk. It looks like that time Pinkie got a tad tipsy many years ago when we were working in the ditch. As you can guess, the amount of deaths by shovels to the head was, well, much. I denounce Mrs. Whoopie's anti-drunk comments as disparaging of the Russian culture! By implication, that is RACIST! Where do I file a civil rights lawsuit? What's the NAACP for Russians? I heard there's AARP - what is it? Association for the Advancement of Russian People? Slander and calumny! That's Whoopie (with an e) not Whoopi. I thought she was your missus, no? How else was she able to acquire such vast knowledge of drunk behavior? Her description of what drunks do and how they think seemed strangely familiar. They don't make mail-order brides like the used to. Mell's mistake was picking one that speaks english. I'm flattered comrade Whoopie, but your compliment for my avatar goes to the Cube. I was awarded by the Glorious People of Cube for my diligent services in contributing visionary views and fighting injustices. If Mel needs a drinking buddy and a shoulder to cry, count me in. In case Mel is reading this, my hovel is at the beet patch #3, easy to spot by the big shovel I'll leave out by the door for the night. As a former rubber boot Supermodel at the rubber boot factory #86, I enjoy digging long trenches on the beach at sunset. I can gladly share some other Supermodel tricks with the shovel if there is a shortage of sand. Life can be tough for Rich Powerful Capitalists when the People's laws and courts have them over a barrel. The Gibson Redistribution will (under our current structure) follow a trickle down path: Gibson > Lawyers > Trickle Somewhere. He used the wrong catalog. I can gladly share some other Supermodel tricks with the shovel if there is a shortage of sand. That's our favorite pastime at the collective! Nice try comrade Red Square. Watch this! Red Square, I beg of you, please don't claim that comrade Pahlen's latest image is Pinkie. My head can't take anymore trauma. No, that's an image of your average, garden-variety gold-digger's Inner Comrade. Tell me, Whoopie, have you ever had one of those days when you say to yourself, "Maybe I should just keep my big yap shut?" That's for mistaking me--ME, PINKIE!--for just another average, garden variety gold digger--and the Inner Comrade of one, at that! Of course, the fact that it never even occurred to Red Square to attribute those gorgeous golden tresses, those breasts that look as if they could be approved by the USCG as flotation devices, and most especially those skull-crushing thighs to me, Pinkie (not that my thighs look like that, I just like the idea of being able to crush skulls with them) can only mean one more thing. Now hold that head up and be proud, Comrade! It's not everyone who gets to stagger around with matching dents on both sides. You could start a trend. Pinkie, have I told you lately those boots make your ankles look fat? I'm thinking of changing my avatar. I thinking of changing my avatar. Considering it was her who not too long ago complained of everyone changing their avatar, I say, do it! It probably won't protect you from her shovel of doom, but hey, you seem to take a liking to annoying Pinkie. What can I say Elliott, she gives good headache. Can we still trust Clinton and Obama?